Northerly aspect with superb landscaping giving direct lawn access to beach and gentle sea breezes for ideal year round climate.Fully fenced, security for 5 cars and boat,keeping your pets safe and providing completeprivacy. Kitchens,Bars,Bathrooms,Bedrooms,Lounges,T/Vs Bbqs,eating & Entertaining Areas on both Levels makes for a fun holiday for everyone. Huge outside area around pool where you can serve a meal for 8 people,or snooze on our famous "Bali" day bed -you could be tempted to be a bit naughty in this secluded spot, but at all times you can watch your children swim or fish at the beach,your own pool or play cricket on the lawn, its designed for a fun safe holiday. Please note all bedrooms contain queen size beds. Downstairs bedroom along with Lounge area which converts to the 4th Bedroom at night,both with sea views and own door access to pool.Linen for all beds and towels,facewashers,bathmats can be provided on request for a small extra cost,let us know your requirements at or after booking for our quote. Walk along beach to local shops and restaurants, or drive 15 minutes to Main City Shopping.Our coastline is an aquatic playground(renowned for fishing,sailing and boating},plus 3 golf courses,driving range,go karts,tennis courts all within 20 minutes drive,plus jump off point for Fraser Island ,Whale watching and Southern Barrier Reef islands. Our "Bali" is located in a very quiet street in a small relaxed village, whilst at your fingertips a vibrant City to give you so many easy choices for your special holiday. Matured aged, a lifetime business and hospitality industry,resided on Fraser Coast Qld for last 30 years,have travelled Australia ,mainly East Coast Queensland. If I can help anyone with any information about fishing ,golf,or lifestyle in general on our great coastline give me a call. My wife & I have resided in Toogoom for over 30 years,as the quiet friendly neighbourhood and year round climate makes for ideal paradise living whilst having a vibrant city of Hervey Bay at your fingertips.We built this home 20 years ago and upgraded balcony and downstairs decking 10 years ago to compliment the special beachfront location and provide ultimate outside living and entertaining whilst keeping your privacy a priority. So many activities ,events,attractions ,and areas to explore means you never get bored,you can be as active as you want. The Beach and Ocean views from all the living and outside entertaining areas was the foremost thought when We designed this northern Aspect Home. Combining this with our Balinese taste and lawn area to give direct access to beach its location is rarely seen on the Coast of Australia, given we are only 3 hours from Brisbane Via The Bruce Highway being 10 Kilometres from our quiet Village.Daily flights to Brisbane & 3 times a week direct flights to Sydney , you would never think this when you relax of a morning or evening looking out over the beach & Ocean, or taking your daily stroll along the beach to get the paper from the shop while your dog skips along with you on such a quiet beach. Extra toilet located downstairs in laundry area is great for use when all people are downstairs using the dining or outside living/entertaining ares.Main bathroom is located upstairs which has spa bath to provide total relaxation.Towels,facewashers & Bathmats can be provided at an extra cost. 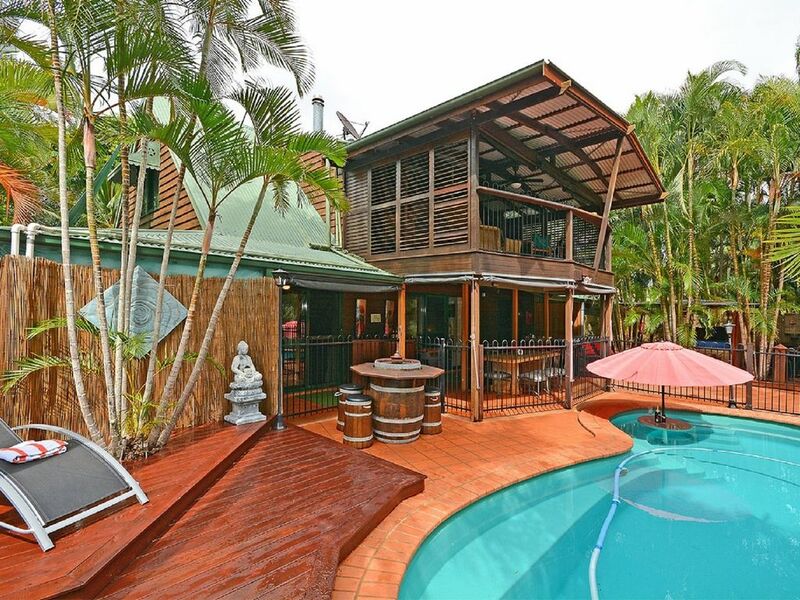 Toogoom is a small population of 1200 with the vibrant city of Hervey Bay at your fingertips. So quiet & peaceful. Home fronts the beach to give magical ocean & beach views from all living & entertaining areas. Direct Lawnn Access to beach from the front gate,no road to cross. Fire wood provided in Winter, for both the upstairs fireplace and the fire bin use in outside living area or can be taken to the Beach. Absolutely amazing relaxing week. We will definately stay again!! Awesome position, great house, we'll be back! The kids loved the pool, the dog loved the beach, the wife loved the peace and quiet - that makes for a great holiday! Spent 4 nights. Had a great time and didn't want to leave. Would highly recommend to family and friends. Thank you to Alan and Rona and Homeaway for the best holiday. even though it rained for 3 out of the 4 days we were there it was great. Our son and his wife and 3 kids came up for 2 days and loved it. Very relaxing ,kids hardly watched TV we all played board games and cards when it was raining. Played on the beach 1 afternoon when it was fine, all had a great time. House and pool was just amazing for all of us. Would recommend it for families to stay or 2 couples. Regards Charlie,Delma Pike and family. We will be back. Best holiday house we ever been. We like to thanks the owners of Bali On The Beach, Allan and Rona for putting together this beautiful peace full holiday home. Congratulations to both of you! The house is complete, nothing is missing, all cooking facilities, I mean nothing missing. Is clean and a beautiful peace full home. Thank you Allan and Rona. Gateway to Southern Barrier Reef, Local tours to nearby reefs plus Air & charter tours to Lady Elliott ,Musgrave & Fraser islands ,plus 4 wheel drive hire via barge to Fraser island. Bikes provided for track around Toogoom water lake & state forest.